There are two main types of glaciers. Continental glaciers cover vast areas of land in extreme polar regions, including Antarctica and Greenland (Figure 16.7). Alpine glaciers (a.k.a. 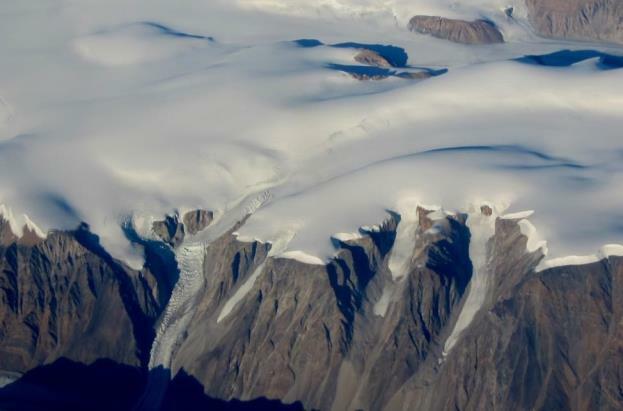 valley glaciers) originate on mountains, mostly in temperate and polar regions (Figure 16.1), but even in tropical regions if the mountains are high enough. Earth’s two great continental glaciers, on Antarctica and Greenland, comprise about 99% of all of the world’s glacial ice, and approximately 68% of all of Earth’s fresh water. As is evident from Figure 16.8, the Antarctic Ice Sheet is vastly bigger than the Greenland Ice Sheet; it contains about 17 times as much ice. If the entire Antarctic Ice Sheet were to melt, sea level would rise by about 80 m and most of Earth’s major cities would be submerged. Continental glaciers do not flow “downhill” because the large areas that they cover are generally flat. 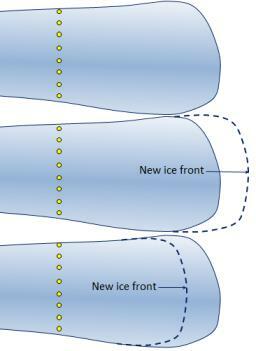 Instead, ice flows from the region where it is thickest toward the edges where it is thinner, as shown in Figure 16.9. This means that in the central thickest parts, the ice flows almost vertically down toward the base, while in the peripheral parts, it flows out toward the margins. In continental glaciers like Antarctica and Greenland, the thickest parts (4,000 m and 3,000 m respectively) are the areas where the rate of snowfall and therefore of ice accumulation are highest. The flow of alpine glaciers is primarily controlled by the slope of the land beneath the ice (Figure 16.10). 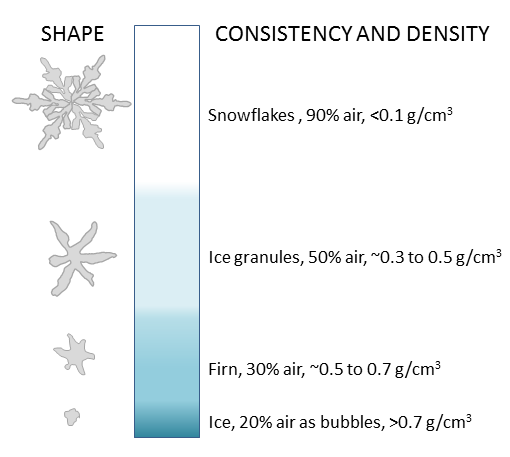 In the zone of accumulation, the rate of snowfall is greater than the rate of melting. In other words, not all of the snow that falls each winter melts during the following summer, and the ice surface is always covered with snow. In the zone of ablation, more ice melts than accumulates as snow. The equilibrium line marks the boundary between the zones of accumulation (above) and ablation (below). Above the equilibrium line of a glacier, not all of the winter snow melts in the following summer, so snow gradually accumulates. The snow layer from each year is covered and compacted by subsequent snow, and it is gradually compressed and turned into firn within which the snowflakes lose their delicate shapes and become granules. With more compression, the granules are pushed together and air is squeezed out. Eventually the granules are “welded” together to create glacial ice (Figure 16.11). Downward percolation of water from melting taking place at the surface contributes to the process of ice formation. 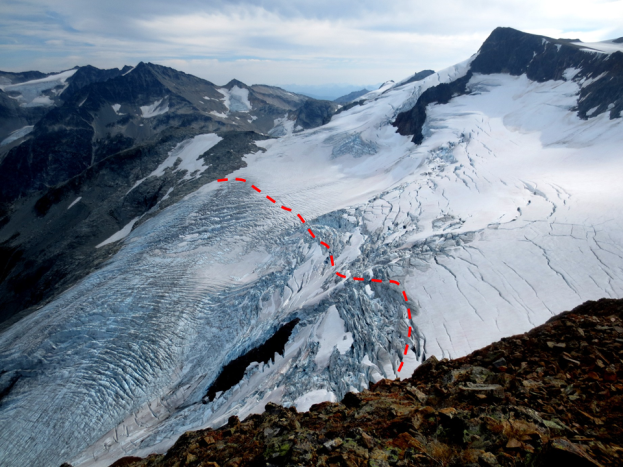 The equilibrium line of a glacier near Whistler, B.C., is shown in Figure 16.12. Below that line, in the zone of ablation, bare ice is exposed because last winter’s snow has all melted; above that line, the ice is still mostly covered with snow from last winter. The position of the equilibrium line changes from year to year as a function of the balance between snow accumulation in the winter and snowmelt during the summer. More winter snow and less summer melting obviously favours the advance of the equilibrium line (and of the glacier’s leading edge), but of these two variables, it is the summer melt that matters most to a glacier’s budget. Cool summers promote glacial advance and warm summers promote glacial retreat. Glaciers move because the surface of the ice is sloped. This generates a stress on the ice, which is proportional to the slope and to the depth below the surface. As shown in Figure 16.12, the stresses are quite small near the ice surface but much larger at depth, and also greater in areas where the ice surface is relatively steep. Ice will deform, meaning that it will behave in a plastic manner, at stress levels of around 100 kilopascals; therefore, in the upper 50 m to 100 m of the ice (above the dashed red line), flow is not plastic (the ice is rigid), while below that depth, ice is plastic and will flow. When the lower ice of a glacier flows, it moves the upper ice along with it, so although it might seem from the stress patterns (red numbers and red arrows) shown in Figure 16.13 that the lower part moves the most, in fact while the lower part deforms (and flows) and the upper part doesn’t deform at all, the upper part moves the fastest because it is pushed along by the lower ice. The plastic lower ice of a glacier can flow like a very viscous fluid, and can therefore flow over irregularities in the base of the ice and around corners. However, the upper rigid ice cannot flow in this way, and because it is being carried along by the lower ice, it tends to crack where the lower ice has to flex. This leads to the development of crevasses in areas where the rate of flow of the plastic ice is changing. In the area shown in Figure 16.14, for example, the glacier is speeding up over the steep terrain, and the rigid surface ice has to crack to account for the change in velocity. The base of a glacier can be cold (below the freezing point of water) or warm (above the freezing point). 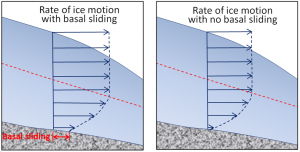 If it is warm, there will likely be a film of water between the ice and the material underneath, and the ice will be able to slide over that surface. 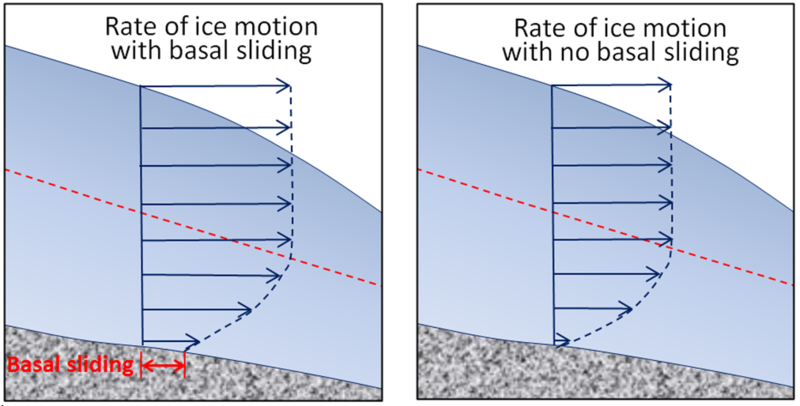 This is known as basal sliding (Figure 16.15, left). If the base is cold, the ice will be frozen to the material underneath and it will be stuck — unable to slide along its base. In this case, all of the movement of the ice will be by internal flow. One of the factors that affects the temperature at the base of a glacier is the thickness of the ice. Ice is a good insulator. The slow transfer of heat from Earth’s interior provides enough heat to warm up the base if the ice is thick, but not enough if it is thin and that heat can escape. It is typical for the leading edge of an alpine glacier to be relatively thin (see Figure 16.13), so it is common for that part to be frozen to its base while the rest of the glacier is still sliding. This is illustrated in Figure 16.16 for the Athabasca Glacier. Because the leading edge of the glacier is stuck to its frozen base, while the rest continues to slide, the ice coming from behind has pushed (or thrust) itself over top of the part that is stuck fast. Just as the base of a glacier moves more slowly than the surface, the edges, which are more affected by friction along the sides, move more slowly than the middle. If we were to place a series of markers across an alpine glacier and come back a year later, we would see that the ones in the middle had moved farther forward than the ones near the edges (Figure 16.17). Calving of icebergs is an important process for glaciers that terminate in lakes or the ocean. 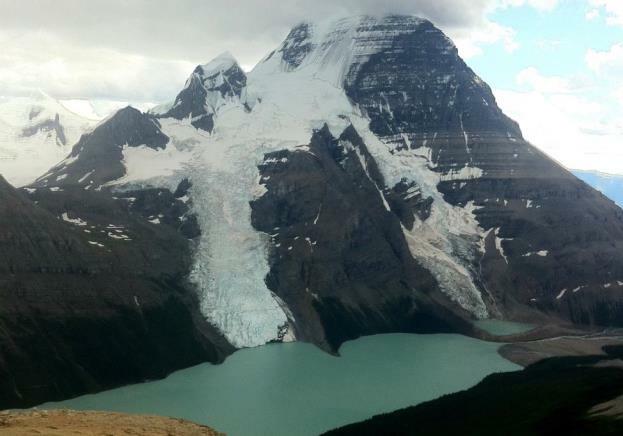 An example of such a glacier is the Berg Glacier on Mt. Robson (Figure 16.18), which sheds small icebergs into Berg Lake. 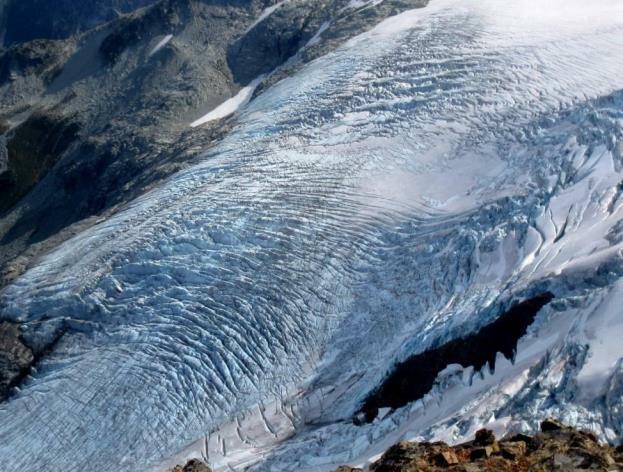 The Berg Glacier also loses mass by melting, especially at lower elevations. 16.2 How Glaciers Work by Steven Earle is licensed under a Creative Commons Attribution 4.0 International License, except where otherwise noted.